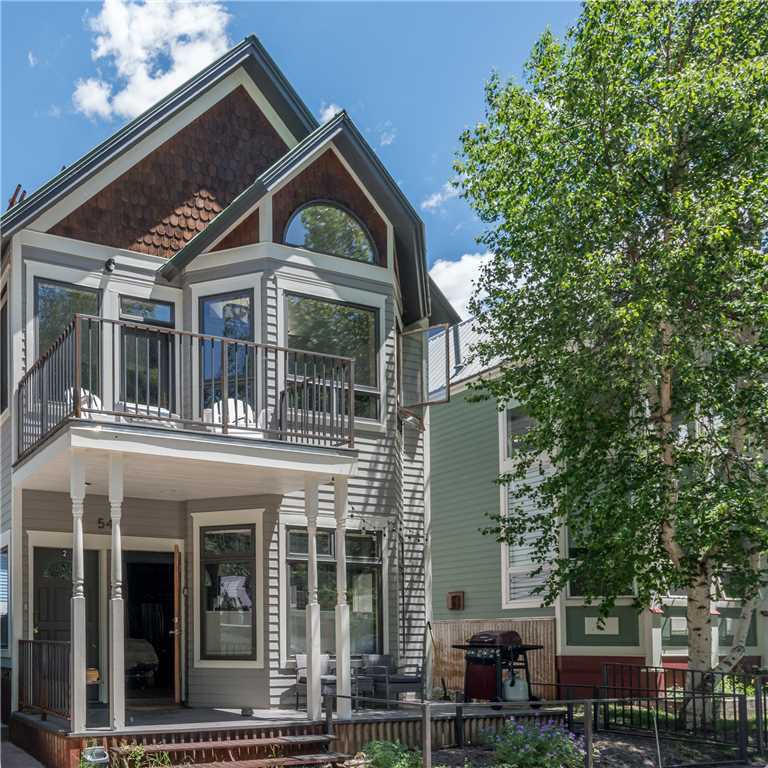 Located in the heart of Telluride's historic district with easy walking distance to everything Telluride has to offer, this quiet upstairs apartment is the perfect romantic getaway. Enter the apartment by walking up the sidewalk at the left (west) side of the 'home' and then up the stairs to the right. Enter the dining room/living room, with vaulted ceilings and wonderful mountain views of Mendota Peak. In the living room is a 46 inch flat-screen HD/LCDTV w/VCR and DVD, stereo with CD and gas fireplace. The dining table seats up to 6 guests. Down a short hall is the kitchen with black granite countertops, kitchen island, TV, and a cozy breakfast nook. Here is where you will find the 1/2 bath and a washer/dryer. Upstairs is the master bedroom with king bed, 32 inch flat screen TV, private bathroom with steam shower and jetted tub with skylight. Both bedrooms have doors to the balcony with amazing views west and north over the roof tops to the surrounding mountains.The 2nd bedroom has a queen bed with Tiffany reading lamps and a 29 inch flat screen TV, and a bathroom with shower only, finished in marble tile.The condo has its own washer/dryer, free wireless Internet access and a parking space off the alley. The free town shuttle stops across the street for easy access to downtown and the Gondola.Upstairs is the master bedroom with king bed, 32 inch flat screen TV, private bathroom with steam shower and jetted tub with skylight. Both bedrooms have doors to the balcony with amazing views west and north over the roof tops to the surrounding mountains.The 2nd bedroom has a queen bed with Tiffany reading lamps and a 29 inch flat screen TV, and a bathroom with shower only, finished in marble tile.The condo has its own washer/dryer, free wireless Internet access and a parking space off the alley. The free town shuttle stops across the street for easy access to downtown and the Gondola.